Because this syndrome so complex and poorly understood, cats who have Feline Stomatitis/Mucositis are a commonly referred to Midwest Animal Dental & Oral Surgery for treatment and management. Successful management of this complex disease requires a logical diagnostic approach. The need for first line information gathered before any treatment is started cannot be over-stated. Once this information is gathered, a treatment plan and prognosis can be considered. Referral is highly recommended so your cat can have lasting and meaningful relief. Stomatitis is defined as inflammation of the mucous lining of the mouth. 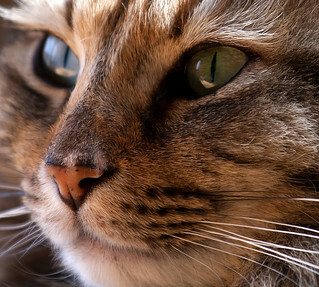 Feline stomatitis is one of the most painful and debilitating disease for affected cats. Typical clinical signs noted are foul breath (halitosis), excessive salivation, bleeding gums, decreased appetite, weight loss and dull and unkempt coats due to poor grooming habits. Other descriptive terms have also been used to identify this condition: lymphocytic-plasmacytic gingivostomatitis (LPGS), and lymphoplasmacytic stomatitis (LPS), with mucositis being the more accurate and appropriate term. The exact cause of this syndrome is unknown, At this time, Stomatitis/Mucositis is considered to be an exaggerated immune response to one or more etiologic agents, which include normal plaque bacteria, dental disease, feline calicivirus (FCC), and feline herpesvirus (FHV). Almost 90% of cats with Stomatitis/Mucositis shed both these viruses. In addition, all cats with this disease should also be tested for FeLV and FIV. Not all inflammatory lesions in the mouth indicate Feline Stomatitis/Mucositis. It is important that an appropriate diagnosis be made under anesthesia by probing all teeth and taking and interpreting full-mouth intraoral radiographs before initiating any medical therapy. It is also important that the degree and distribution of inflammation be documented for tracking of response to therapy. Caudal Mucositis: Tissues of the caudal oral cavity lateral to the palatoglossal folds. Proliferation of this tissue is not uncommon. Labial/Buccal Mucositis: Inflammation of the lip and/or cheek mucosa. Concurrent dental disease, like periodontal disease and tooth resorption can confuse and compound this syndrome. Even though Feline Stomatitis/Mucositis is considered to be a chronic, incurable disease, near-full mouth extractions or complete extractions is the preferred initial treatment before any other. Dental extractions are the most predictable treatment course for providing definitive resolution of inflammation and pain. The earlier the oral surgery (extractions) is performed in the disease process the better the prognosis. Elective near-full or complete mouth extractions of all quadrants should be performed by a skilled surgeon and only under the guidance of dental radiographs. Post operative pain management of these cases is imperative to a quick recovery and return to eating. Some cats may be hospitalized for 2 –3 days. Midwest Animal Dental & Oral Surgery specializes in these complex diseases and have the knowledge and skill to treat this disease allowing Feline Stomatitis/Mucositis patient to live a functional and full life!